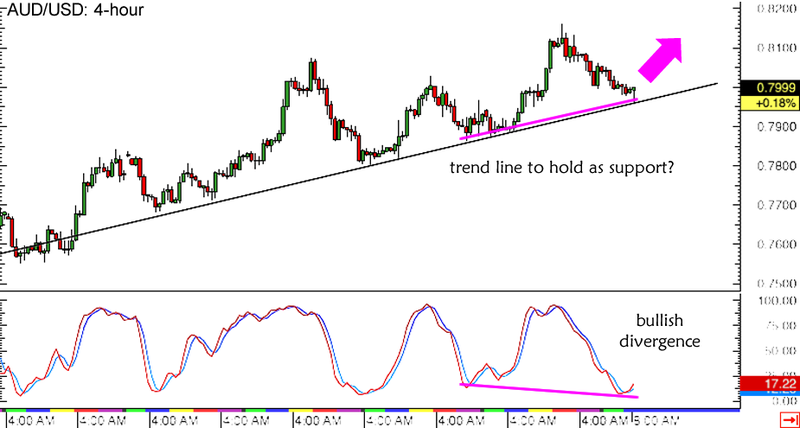 As I showed y’all in my Comdoll Trading Kit for this week, I’m eyeing this rising trend line setup on AUD/USD’s 4-hour forex chart. Now that the RBA monetary policy meeting minutes are out, I’m thinking that a bounce is likely. Even though the Australian central bank decided to cut interest rates by 0.25% in their May statement, the transcript of their discussions suggest that they might not ease again anytime soon. Policymakers highlighted the persistent weaknesses in the economy but seemed hopeful that their recent stimulus efforts, combined with the Chinese central bank’s interest rate reductions and RRR cuts, would eventually shore up growth. From a technical standpoint, I’m seeing a long bottom wick on the candlestick that just touched the rising trend line support and the .8000 major psychological level. In addition, price made higher lows while stochastic drew lower lows. That’s divergence right there! Notify Jeanine Matthews and alert the troops! Oh wait, this ain’t the Divergent movie series and Theo James isn’t in sight. Darn it. I’m considering going long at this current support area with a stop below the trend line or the .7900 handle. It seems that the setup has met the 9 Rules for Trading Divergences anyway, as stochastic is starting to move up from the oversold area. I’ll be keeping an eye out for the U.S. building permits and housing starts report due in today’s New York forex trading session, but I’m not too worried about seeing upside surprises since economic data from the U.S. has been pretty disappointing these days. What I’m a bit wary about though is the FOMC minutes up for release tomorrow so I’m hoping to be able to make adjustments to my position by then. I’ll keep y’all posted!